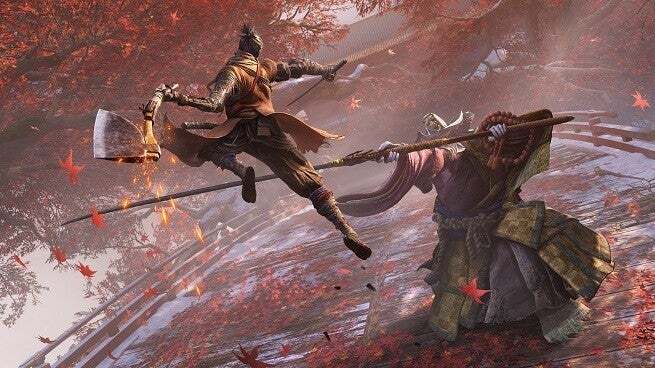 FromSoftware -- the team behind Bloodborne and the Dark Souls series -- have confirmed that its upcoming game, Sekiro: Shadows Die Twice, won't have any microtransactions. While the news isn't surprising per say, given the developer's history and the game's single-player nature, it is good to know when you consider that Activision is on-board as publisher, a company that is quite familiar with microtransactions and could have conceivably forced them into the game. News of no microtransactions comes way of PR representative Wiebke Valentine (via COGconnected), and following a recent PlayStation UK Store listing that listed the game as having them, which is evidently an error on its behalf, an error that caused quite a bit of controversy in the brief time before it was debunked. Originally teased at The Game Awards 2017, before being announced at E3 2018, Sekiro: Shadows Die Twice is in development for PlayStation 4, Xbox One, and PC, and is scheduled to release on March 22, 2019, 100 percent microtransaction free. "Carve your own clever path to vengeance in an all-new adventure from developer FromSoftware, creators of the Dark Souls series. "In Sekiro: Shadows Die Twice you are the "one-armed wolf", a disgraced and disfigured warrior rescued from the brink of death. Bound to protect a young lord who is the descendant of an ancient bloodline, you become the target of many vicious enemies, including the dangerous Ashina clan. When the young lord is captured, nothing will stop you on a perilous quest to regain your honor, not even death itself. "Explore late 1500s Sengoku Japan, a brutal period of constant life and death conflict, as you come face to face with larger than life foes in a dark and twisted world. Unleash an arsenal of deadly prosthetic tools and powerful ninja abilities while you blend stealth, vertical traversal, and visceral head to head combat in a bloody confrontation. "Take Revenge. Restore your honor. Kill Ingeniously."